The world's largest land plane, the XC-99, made its first flight in San Diego on 23 November 1947. The XC-99, serial 43-52436, is a double deck transport variant of the B-36. It has a considerably larger fuselage, but was never fitted with jet pods. The wingspan is the same 230 feet, but the fuselage is 23 feet longer at 185 feet. The payload of the XC-99 was 101,000 pounds or 400 fully equipped troops. Delivered to the Air Force on November 23, 1949, the XC-99 was retired in 1957. Following its retirement, the XC-99 was on public display at Kelly Air Force Base near San Antonio, Texas until 1993 when it was moved to Wright Patterson Air Force Base for restoration. Not sure if the entire plane has been moved yet. Saw some pictures online that show that the upper deck has been cut off and shipped to Dayton, along with much of the wings and tail except for the main spars and such. please could you tell me the source of this pictures? The production version profile is right, but I have been reading Magnesium Overcast by Dennis R Jenkins (page 33) and a VDT engined version was studied but there is no single mention about a C-99 jet powered version. A similar cutaway (English text) is also included on Mr Jenkins's B-36 book. I modified drawings I scanned from my copy of B-36 in Action based on the drawing of the production C-99 in Magnesium Overcast, the one posted by Golfus. 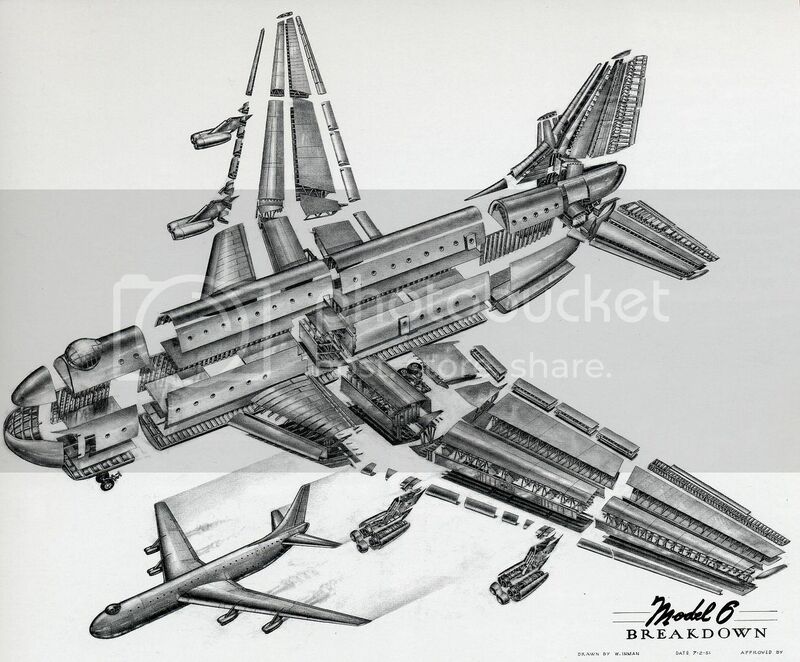 I also found a large exploded drawing of a proposed jet powered C-99 while surfing the vast and infinite web. It may have even been here, I'm not sure. Seen here was the next logical step for Convair, marrying the swept-back wings of the YB-60 and the fuselage of the XC-99. The Model 6, however, retained the rounded cockpit of the B-36 rather than the airliner-style windows of the XC-99 (Model 37). The YB-60 was Convair's proposal for a large long-range heavy bomber; this was based on the B-36. Only two YB-60s were built; the USAF opted for Boeing's Model 464 (better known as the B-52) instead. This rare illustration comes from Dennis Jenkins et al., "B-36 Photo Scrapbook," (Hinckley, Leics. : Specialty Press, 2003), p. 85. This is the companion book to "Magnesium Overcast," by the same authors. higher res file, just drop a PM with a mail adress. Convair Model 37 designed to carry 204 passengers based on the XC-99. Cross section artist impression of Convair Model 37. Interior design by Henry Dreyfus. Nice artist's impression of a civilian Model 37 liner from a 1945 Time Magazine advertisement. 99 ( !) pictures of the Convair XC-99 at SDASM Archives. Some pictures are in colour, others show the cockpit. Looks like a BUFF had a midair with a B-36! Isn't that the XC-99 with YB-60 wings & tail? The Convair XC-99, a prototype heavy cargo aircraft built for the US Air Force, was the largest piston-engined land-based transport aircraft ever built. It was derived from the B-36 bomber. The first flight was on 23 November 1947 in San Diego, California. After initial testing, the giant aircraft was delivered to the Air Force on 23 November 1949. The XC-99 is currently being restored for eventual display at the National Museum of the US Air Force at Wright-Patterson AFB, Ohio. The prototype Convair XC-99 made its first flight at San Diego, California on November 23, 1947. It was powered by six 28-cylinder, 4,360-cubic-inch radial engines. From Air Force Engineering Division Film: Experimental and Research Aircraft. Color video of Convair's wide-body transport derivitive of the B-36. Video starts with a landing of a B-36B at Convair's Fort Worth plant followed by the giant XC-99 rolling out to the runway for a slow takeoff. Pan American World Airways "Preview of Tomorrow's Flying Clippers" post card set showcasing the Convair Model 37. "Cross-section showing 'private club' comforts"
"Clipper Express--When hours and dollars count"
"Departure time on the high-road in the air"
"Air-conditioned for five miles a minute flight"
In 1940/41 US funded Very Heavy Bombers (XB-29, Consolidated XB-32 Dominator, both deployed in Pacific; Martin XB-33A Super Marauder, chopped; Consolidated XB-36, deployed post-War) and gargantuan transports Lockheed L-89/XRO6-1; Boeing XC-97 Stratocruiser; XC-99/Model 37; Douglas 415A XC-74 Globemaster (to be Mk.I). The transports spawned civil schemes, despite pre-War carriers having difficulty selling 40 seats long haul. None, though, was funded with airline use in mind. This entire Heavy program was intended to permit US (neutral, remember, when they were all initiated) to carry the fight - warload, soldiers, Marines, freight - to Japan and/or Germany in the absence of bases in overrun China/Philippines, and/or neutralised UK/Iceland. By 1943 it could be assumed that case would not arise, so some schemes lapsed, C-97 and C-74 were scaled down, XC-99 and XRO6-1 dribbled vaguely. If I were of a conspiratorial nature, disposed to blame Truman for the Cold War, I would wonder muchly why he persevered, after VJ Day but before the Berlin Airlift, with B-36 (and its greatly improved nukes) into production and deployment. ...Thanks for finding that clip, sir. Now downloaded and stored in my archives! Thanks fightingirish; a pleasure to watch. This is my favourite aircraft, though challenged for top spot by Myasishchev M-50, Alekseyev KM, Antonov An-22, Sud-est SE-200, Tupolev ANT-26, Hughes HK-1 Hercules, & North American XB-70. Is there a way to copy this video clip to my computer? I have been under the impression one could not. upload it to my photobucket account, send you the url and you can download it then. Is there a way to copy this video clip to my computer? I have been under the impression one could not. Most common software is Downloadhelper, which works on Firefox browsers. Optimized for YouTube, Downloadhelper is free (as is Firefox) and couldn't be easier to use. Thanks for posting those images - love seeing the drawings and the photos! ...Not to derail the thread, but I've found that YouTube Downloader actually performed better than Downloadhelper. Prior to release 3.x, I could set up as many as 20 separate streams downloading at the same time, with an average of 50kps DL rates for each stream, but on occasion I'll get what I call "traffic jams", where up to half the streams will just stop and/or drop down to a trickle until one or more streams finish downloading. I haven't seen this with 3.x, but it limits you to three streams without paying for the pro version, but setting up download queues is a lot easier and essentially lets me download a ton of clips without having to keep an eye on things. Either way, I always recommend to anyone finding clips of interest on YouTube that they download the clip instead of just bookmarking the link, because odds are the MafRIAA or the WiMPAAs will file a bogus DMCA notice on the clip and have it pulled down before you decide to click that bookmark again. You'll get one additional button on youtube and other sites (download) and you'll have the opportunity to choose the quality of the downloaded file. Sorry for the offtopic comment. [quote author=Dronte]Why to spend money in a development from zero if military designs can adapt? Consolidated-Vultee XC-99 model photo found on eBay.